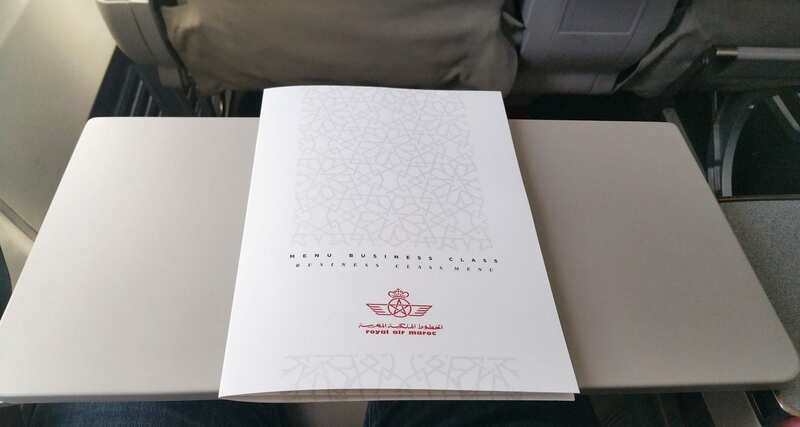 I flew from New York to Frankfurt via Morocco with Royal Air Maroc last year. 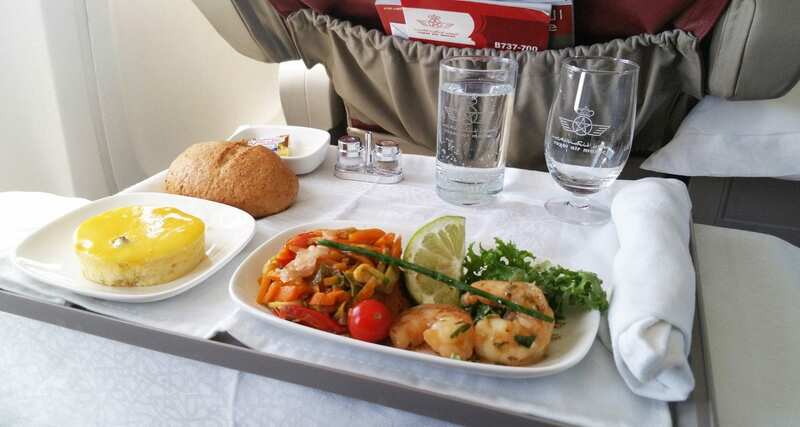 The airline had reached out to me to see if I would be interested in sampling their economy and business class meals. 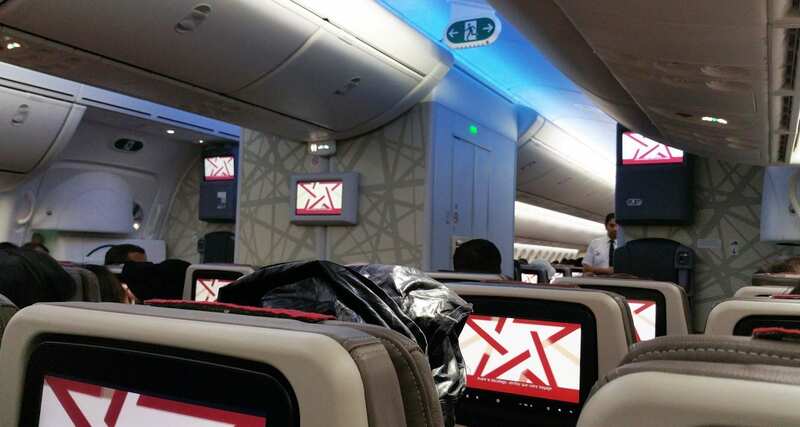 I took them up on their offer and was given a ticket that included a sector from New York to Casablanca on their 787, and then a quick change of aircraft to a Boeing 737 in business class. 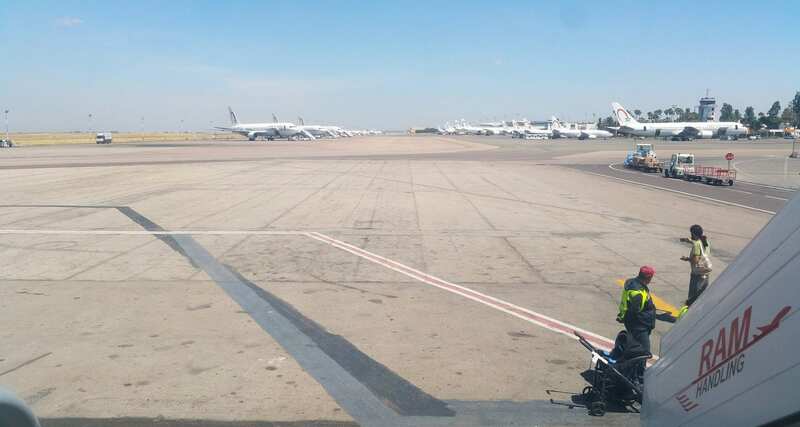 The flight left New York in the evening and arrived into Casablanca the following morning just after 8 am. Their 787 is quite spacious, and it was a pretty uneventful night flight. For dinner, I selected the beef (small portion) served with rice, on the tray was a yoghurt, pasta entree, bread roll, cheese/crackers and a chocolate cake for dessert. 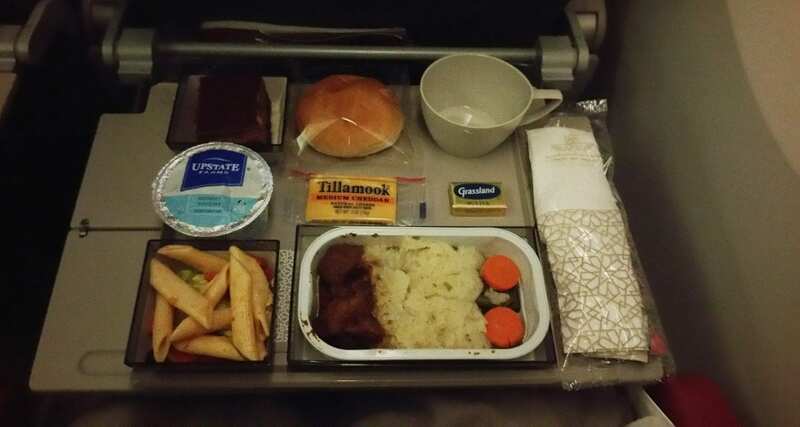 Nothing special here, your typical standard economy class meal tray, that in my opinion was slightly below average regarding taste and quality. What I liked most here was the meal tray set up, it was designed well, and the style of the various tray components was interesting. Hello Morocco! After a slightly confusing transfer experience at the airport, I finally settled at the airline’s lounge. While I have no pics of the experience here, it was overcrowded and the food offering was quite average too. My flight to Frankfurt was aboard a Boeing 737, with proper business class seats which were a nice touch. 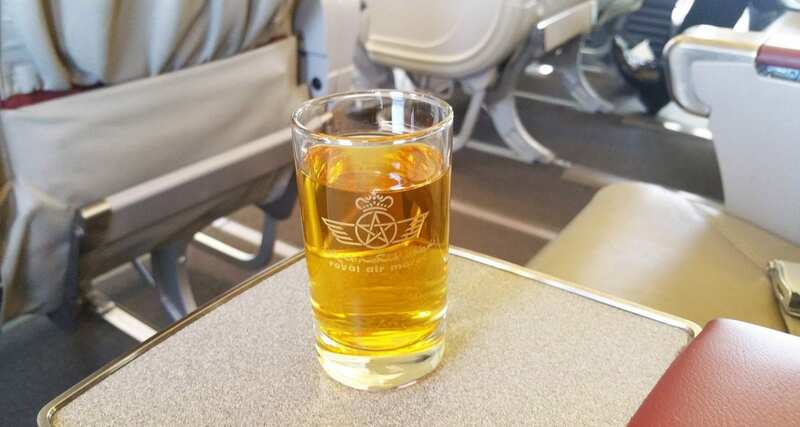 Upon sitting down, I was offered a choice of welcome drinks, and I selected the apple juice. After take off the crew came through to provide inflight menus, additional beverages and some snacks. Don’t you love the details of the glass? Not often you see this. After takeoff welcome drink and nuts. Entree: Asian prawns with vegetables and ginger. Main: Chicken tagine with lemon sauce with potatoes and olives. Cod fillet in chermoula sauce with carrots and potatoes. Martini, Gordons Gin, Smirnoff Vodka, Camus Cognac, JW Black Label and Champagne from Laurent Perrier. Wines were a mix of French and Moroccan, and they offered the Beer Casablanca brand. 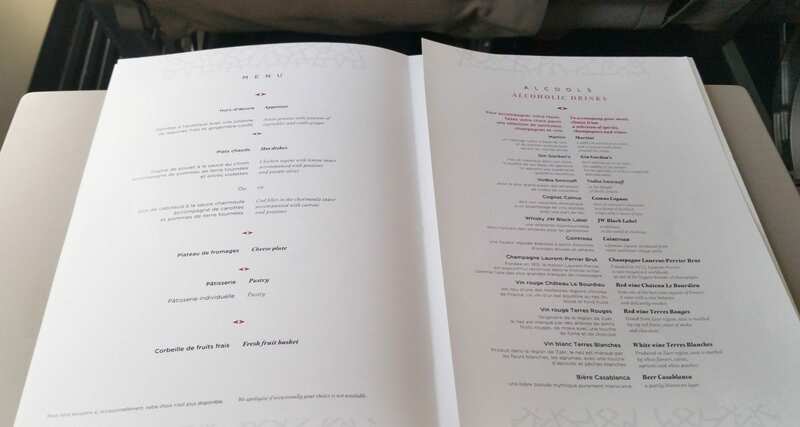 The meals were exceptional, up there with some of the best business class meals I’ve experienced. The entree was very delicious, fresh and so tangy. I couldn’t believe how refreshing it was, and all the flavours paired so well with one another. My chicken dish was also delicious, served piping hot, and a right balance of flavours. I’ve never sampled the traditional dish of Chicken tagine, so it was a lovely experience to have something typically Moroccan. For business class I really couldn’t fault the airline at all, the meals were excellent, and presented very well. Economy class, on the other hand, was very standard, and nothing stood out as unusual or even different from other airlines. From a service point of view, I also felt that the staff could have tried to engage other passengers or me more. Maybe it’s a cultural thing or a lack of communication. I just found them to be very distant and difficult to engage in conversation. I’m not saying they were rude at all, they did their job, but did not go above and beyond. Thanks to RAM for the complimentary ticket, while I received a free ticket my opinion is factual and based on my experience, yours could be different.